INDUSTRY.co.id - Jakarta - Ka. Corporate Communication PT Pupuk Indonesia (Persero), Wijaya Laksana said, fertilizer supply ahead of the current holiday is sufficient for the needs of up to 2 months ahead. For total national fertilizer stock up to June 7, 2018 line III and IV 1,264,532 tons from minimum requirement of 279,462 tons. The details of fertilizer stock consisted of 534,911 tons of Urea, 340,801 tons NPK, 144,198 tons SP-36, 135,769 tons ZA, and 108,853 tons Organic. "This stock is enough to meet the needs of farmers over the next two months," said Wijaya through a written statement in Jakarta, Saturday (9/6/2018). Wijaya Laksana also added that ahead of the holiday, Pupuk Indonesia Group has implemented several strategies such as securing the availability of fertilizer supply in the region and the smooth distribution of fertilizer in the regions in accordance with the standardization of 6 precisely. PT Pupuk Indonesia (Persero) has a strong distribution network throughout Indonesia, specifically to meet the needs of fertilizer in agriculture and food crops. Currently PT Pupuk Indonesia, which is 1,542 distributors, 45,005 kiosks, 18 units of Fleet Ship, 652 units of Warehouse Line II & III with a capacity of 2,981,078 tons more and total Warehouse capacity of approximately 3,548,478 tons, Line Warehouse I with capacity 567 400 tons, 3 units (14 distribution centers) of fertilizer loading in Line II, 4 Ship Wharves (PT Pupuk Iskandar Muda, PT Pupuk Kalimantan Timur, PT Pupuk Sriwidjaja Palembang and PT Petrokimia Gresik), 6,288 units of truck fleet, and Voyage ± 194 route . In ensuring the distribution of subsidized urea fertilizer and preventing the occurrence of irregularities in the field disparities, the government implements a system of Closed Subsidized Fertilizer Distribution using a distribution system with a Definitive Needs Assistance Plan (RDKK). 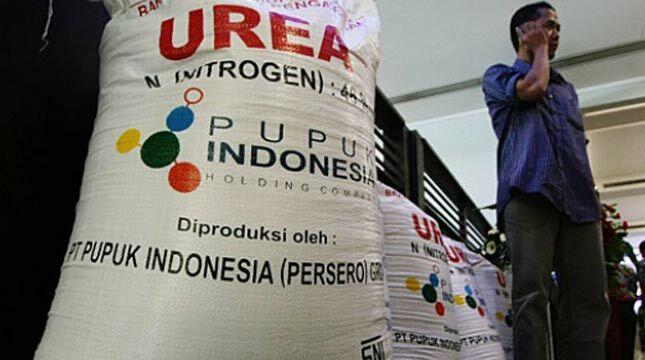 In accordance with the provisions of the Ministry of Agriculture, fertilizer producers are required to keep the stock up for the next two weeks but in practice, Pupuk Indonesia prepares stock equivalent stock for one month ahead. This is to prevent the occurrence of scarcity in the event of a spike in demand in the growing season. "Indonesian fertilizers are obedient to the government regulations, in carrying out the mandate for the distribution of fertilizer according to the principle of 6 Exactly, ie on time, exact quantity, exact place, exact type, precise quality and exact price," said Wijaya.